I found this recipe in the Gather around the Amish Table cookbook. Read below for more information about this new cookbook. Mix together cake mix, eggs, and oil. Reserve 3/4 cup crumbs. Put remaining crumbs into 9 x 13 inch pan. Melt butter, chocolate chips, and sweetened condensed milk together until just combined. Pour on top of crumb crust in pan. Top with remaining crumb mixture by spoonfuls. Bake at 300* for 20-30 minutes. My notes: My mixture wasn’t a crumb mixture. It was more the texture of cookie dough. 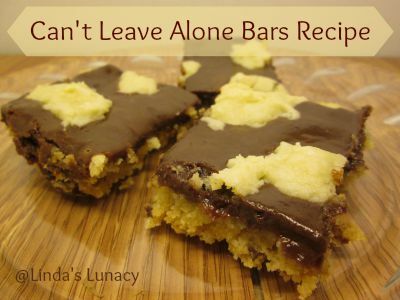 The sweetened condensed milk and chocolate chips make a kind of fudge sitting on top of the cookie. Yum! This recipe lends itself well to some creativity. Use different flavored cake mixes and different flavored chocolate chips, or peanut butter chips, etc. Keep reading to get a great lasagna recipe and to see how you can win a copy of Gather around the Amish Table! I have loved reading this cookbook! It compiles favorite family recipes from Amish and Mennonite kitchens. the recipe contributors also share stories about their recipes and their families. You will find some recipes to use whether you cook everything from scratch or use some prepackaged foods like the cake mix in the recipe above. I have found quite a few recipes that I want to try. Get your fall baking underway with an Amish baking basket giveaway from Lucy and MennoMedia! Enter today by clicking the icon below. But hurry, the giveaway ends on September 29th. The winner will be announced September 30th on the Litfuse blog.